Operating at between 550 and 1240 watts, the heated Jet Towel is ideally suited for areas with a low ambient temperature such as warehouses or other unheated washroom facilities. Heater unit – The heater stores heat when the unit is not in use, blowing out that warmth when operated. Inserting the hands instantly triggers a warm air-jet of approximately 35°C. All for a maximum power consumption of only 1240 watts! Energy efficient – The Jet Towel’s advanced design coupled with its low power consumption motor brings a short drying time, resulting in the lowest energy costs available. Cost saving – The Jet Towel has real operational cost advantages due to the low maintenance requirements and market-leading energy savings. Improves hygiene – The Jet Towel offers a very hygienic solution with its non-contact drying and anti-microbial material. Independent air-ducts guarantee fresh air-flow. Super fast drying – Water is simply blasted away with up to 106m/s mph airflow, rather than evaporating, enabling hands to be dried in just 9-11 seconds. Environmentally friendly – The Jet Towel removes the need for paper towels, reduces CO² emissions with its low energy consumption and eliminates the use of chemical detergents associated with wash cloth roller towels. Quiet operation – The new hyper-nozzle resolves the problem of mutual interference noise between air currents and reduces the noise level to below 61 dB. Ergonomic design – The arch-shaped form is designed with rounded edges, reducing contact when inserting or withdrawing the hands. Long life – The efficient brushless motor is designed for seven years of service at 400 uses per day. Easy to clean – All parts that come into contact with water have had an anti-microbial treatment. The material has also been treated to withstand alcohol-based cleaning products. 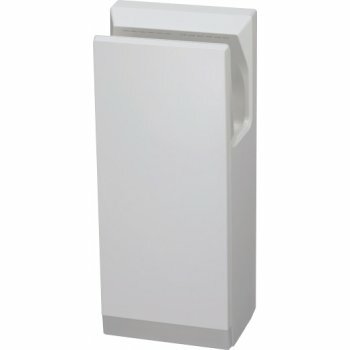 Aesthetic style – With its clean lines and smart appearance the Jet Towel compliments any washroom design.